Today I received a “dummy” of the At Home hardback book. It just had a white dust jacket, but I printed out a copy of the cover and glued it on. Inside was Section 7 — Sweet Endings — repeated over and over and over to make 512 pages. But the pages were the real thing. Not something I looked at on a screen or printed out on my HP inkjet printer. It weighed in at 3 1/2 gorgeous pounds! I also received the “scrips” — what I understand to be printer’s lingo for the printed pages folded together before they are cut and organized into the book. Again, the real thing — the actual printed pages in all their glory. Wait ’til you see this. Down to 10 days to shipping. Today’s chapter preview countdown is Chapter 7 — Easy Entrees: From the Grill. From the Grill begins with a Mastering the Grill lesson, my advice for making you a better griller — and ends with how to do a grill-based Asian Noodle Bar. 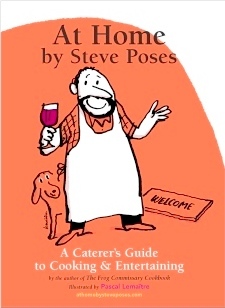 It includes a chart of marinades and recipes for a boatload of international marinades along with side notes that highlight the “flavor profiles” of a spectrum of international cuisines. In between there are 17 grill-based recipes. Quite a lot. My recipe for today is Thai Thighs. Lots of grill recipes competed for space in this chapter, but I could not resist including a recipe named Thai Thighs. It includes two things I love – Thai flavors and chicken thighs. I know breast-people outnumber thigh-people — and we have a host of chicken breast recipes in the book, but I am pleased to say we have several chicken thigh recipes. Thighs are much more flavorful than breasts, juicer and are wonderful boned with skin removed as they are here. Chicken thighs pack far more flavor than breasts and are much more forgiving of overcooking. They take to the grill particularly well. Given their low price and myriad assets, they’re pitifully underutilized. The sugar in this marinade makes for an extra level of caramelization—and a messy grill. You can also use any of the marinades in this chapter and follow the marinating and grilling procedure below. Though strongly influenced by its towering neighbor, China, Thai food has maintained a distinctive flavor profile, relying on the widest range of herbs and aromatics. As with all the foods of Southeast Asia, the balance of sweet, sour, hot and salty is critical. Tomorrow: Chapter 9 – Easy Entrees: Condiments. Just about two weeks left to order the book to receive a signed and numbered first edition.